“Constructed at Saint-Nazaire between January 1931 and September 1934, the Normandie would have a brief commercial life. After a ceremonious launching (on the occasion of which Georges Thill recorded a song for the firm of Salabert), followed by an inaugural crossing in May-June 1935, ‘the greatest ocean liner in the world’ - and the most luxurious - went on to a career that was soon interrupted by the Second World War, and then to a scarcely longer career transporting troops under the name Lafayette, after being requisitioned by the United States. Although it was irreparably damaged by fire in New York harbour in 1946 and later broken up, it left a mythical memory as the apogee of transatlantic travel and the summit of Art Deco, with its sumptuous lacquers by Jean Dunand, murals by Dupas and glass columns by Lalique, not to forget the famous poster by Cassandre. Some idea of the splendour of the ship can be gained from contemporary newsreel footage and illustrated magazines and from scenes filmed on board and included in the movies LES PERLES DE LA COURONNE (1938) and PARIS-NEW YORK (1940). 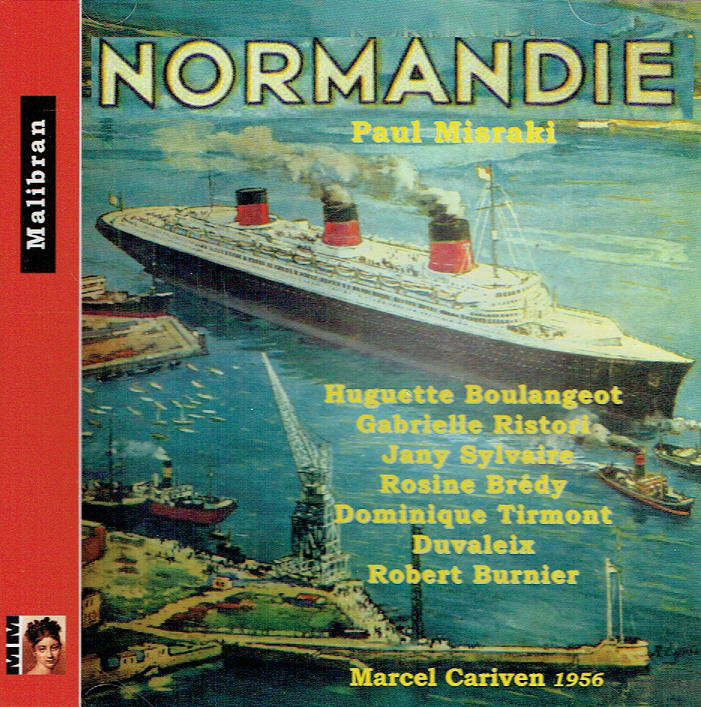 In the Autumn of 1936, when the Théatre des Bouffes Parisiens presented an operetta entitled NORMANDIE, entirely set on board the ship, the subject was still in the news. The libretto was authored by Henri Decoin (better known as a film maker). Three American millionaires, Jim, Ralph and John return to New York with their respective daughters Betty, Barbara and Margaret. The first is attracted to a lift attendant from the Hotel Crillon, who is a stowaway on board the Normandie. The second falls in love with a radio operator and the third succumbs to the charms of the ship's gym instructor. Following a well-established tradition, the lyrics were not by Henri Decoin but were entrusted to André Hornez who made his name working with Ray Ventura and his orchestra. The music for this operetta in two acts and eleven scenes was composed by Paul Misraki (1909-98) then a composer and pianist for Ray Ventura. In 1935 he was propelled on stage thanks to the phenomenal success of TOUT VA BIEN MADAME LA MARQUISE. 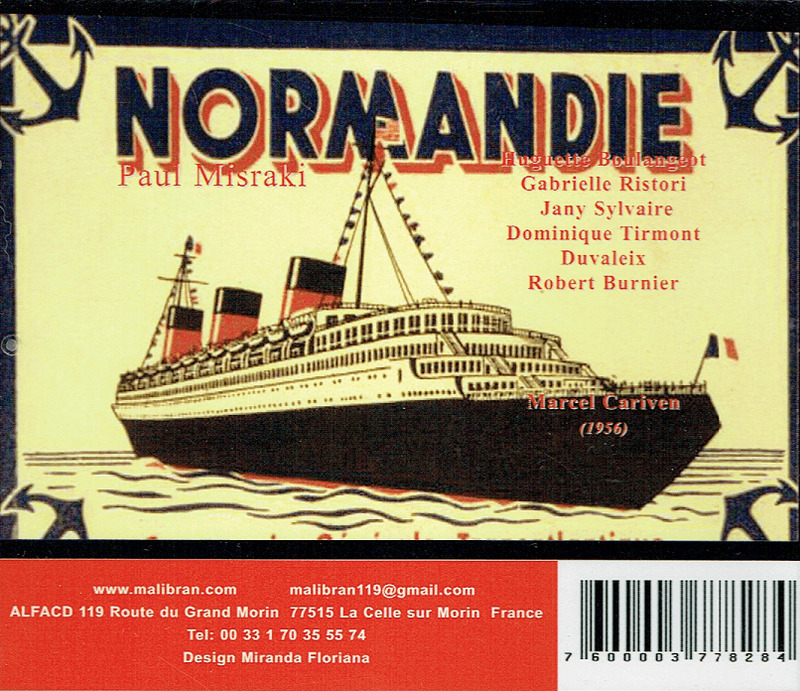 NORMANDIE inspired Paul Misraki to compose another of his most famous songs ‘ça vaut mieux que d'attraper la scarlatine’ which also encourages us to look on the bright side, to smile when everything looks bad. At the premiere it was performed by Suzanne Dehely who was a specialist in crazy and exuberant roles. 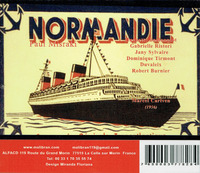 Premiered on October 3rd 1936, NORMANDIE ran for 95 performances until January 1937. In the original cast, amongst the stars whose names are forgotten today, we notice the actress Mila Paréty, who played one of the sisters of the heroine in LA BELLE ET LA BETE by Jean Cocteau (1946) as Margaret and in the more episodic role of the Commissionaire, the actor Noel Roquevert who played many secondary roles in French cinema. In 1936 the orchestra of Bouffes Parisiens was conducted by Marcel Cariven who also took charge of the concert given by RTF twenty years later. Columbia, for whom Thill was contracted to record, prevented the issue of the disc, of which only two copies survive. You can find the song in our forthcoming issue of the complete recordings of Georges Thill."